Last August we praised the process European Central Bank (ECB) President Draghi imposed on the Eurozone (read “Draghi’s Genius”). In return for ceding sovereign control over budgets to Eurozone partners, i.e. for political integration, Draghi promised the ECB would act more like a “normal” central bank, buying Treasuries of nations asking for help; this is the framework of the Outright Monetary Transactions Program (OMT). Draghi’s announcement not only turned the euro around, it reversed the capital flight from the “periphery” to the “core” of the Eurozone, i.e. from weaker to stronger countries. Beyond that, it triggered a change in global market dynamics: risk on / risk off correlations melted down way beyond the currency markets, forcing investors to start thinking again rather than merely chasing trends. When the markets were in a good mood, money went to the Eurozone rather than commodity currencies associated with “risk on” in recent years. In the period leading up to Draghi’s announcement of said OMT program, European policy makers appeared to run around a bit like headless chickens. A year ago Draghi had implored them to give citizens a vision, define roles, set deadlines, and to hold people accountable. When policy makers failed to deliver, he took it on himself to show a path forward. Draghi clearly reduced the chances of a variety of tail risk scenarios unfolding. In an environment where the euro was most unloved, with risks reduced, we were buyers. Our argument was that this year the euro should benefit as the normalization process continued, fully realizing that the process wasn’t perfect. But then again, we don’t have a perfect process in the UK, US or Japan, either. What we were under-estimating was the extremes to which policy makers in the periphery would go to retain power. Prime Minister Rajoy in Spain would rather raid the pension funds than open Spain’s books to EU bureaucrats. And in Cyprus, the prime minister would rather seize assets of small-time savers, in an effort to maintain its business model of attracting money from Russian oligarchs. Cyprus could have received much more generous help from the Eurozone, had it renounced its addiction to money that looks to escape Russian taxation. 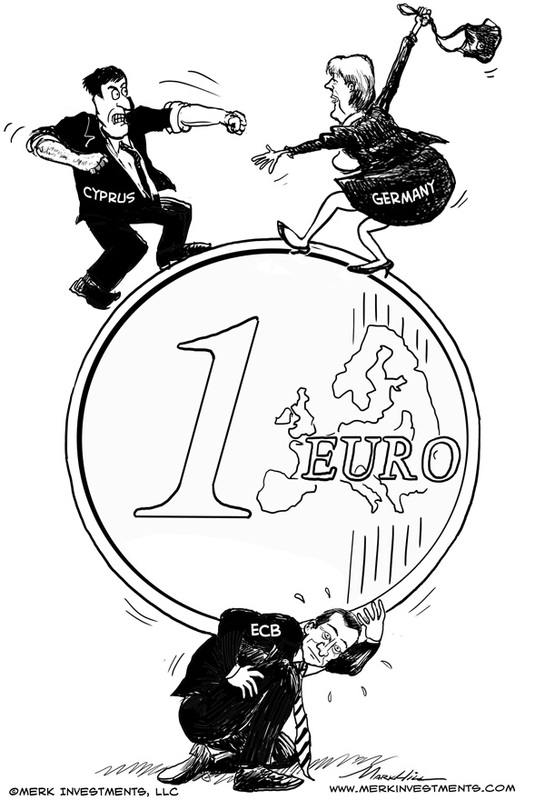 Draghi is carrying the weight of the Eurozone on his shoulders. He can’t do it alone. But European policy makers are not willing to choose the path of “political integration,” as it would require giving up cherished ways of doing business. This was also the case in Ireland, where the government was unwilling to give up low corporate taxes that attract foreign businesses. In the meantime, the Eurozone, often in conjunction with the International Monetary Fund (IMF), is willing to help. Yet Germany in particular was not willing to bail out Russian oligarchs in Cyprus. When the nation of merely 1.1 million people needed an astounding €17 billion to bail out its banks, €10 billion in aid was offered, with the remainder to come from Cyprus itself. Time had run out for a government debt restructuring; banks in Cyprus almost exclusively rely on deposits to fund themselves and have few, if any, other creditors that could have been asked to take a “haircut.” So it was up to depositors to bear the burden. By “taxing” deposits, countries like Germany can save face in front of their constituents, arguing that they did not bail out Russian oligarchs. But in good European fashion, the details were left up to the bureaucrats in Cyprus to figure out. That may well be the key reason why it appears like Groundhog Day whenever another bailout is announced: the local bureaucrats are overwhelmed with the bad choices they are faced with. Most notably, they tend not to be aware of the unintended consequences of their actions. So they came up with the idea of taxing all deposits, including “insured” deposits of less than €100,000. Not only may it be political suicide for those voting in favor of the scheme, others in Europe may well fear that their deposits might be next. Of course Cyprus is “unique,” but the damage has been done, even if an eventual compromise ends up protecting some, or all, small deposits. By dragging out a decision, even a bad one, ever more confidence is eroded. The problem, as always, is that there’s no coherent framework in which all of this takes place. In the U.S., there is FDIC insurance. When a bank is seized, deposits of over $250,000 are at risk. There’s no “tax” on deposits: deposits over $250,000 might be wiped out entirely. Note that according to Bloomberg, since 2008, depositors in Cypriot banks earned about double the interest of depositors in German banks. Weak banks attract capital by offering higher yields - risk free it is not for the depositor. But instead of accelerating the move towards a single European Bank regulator to develop a coherent pan-Eurozone scheme, countries like Germany are pushing back, afraid of ceding too much power. So what we have on the one hand is a committed ECB that provides a path to political integration, and on the other, Eurozone policy makers balking at political integration. Looking at it from the 100,000-foot perspective, there’s nothing new. However, at 100,000 feet, one better wear a pressure suit. From a 40,000-foot perspective, where an oxygen mask suffices, new rocks have been thrown on the path to becoming a rock star. That view, by the way, is greatly influenced by the fact that liquidity is being mopped up in the Eurozone as banks pay back their loans (LTROs) to the ECB, whereas the UK, US and Japan appear to be on a path of further monetary expansion. What are investors to do? Buy gold and be done with it? Note that while gold rose based on the seemingly dysfunctional process, it rose by less than a percent on Monday. If investors thought a bank run beyond Cyprus were to ensue, gold should be much higher. But then again, the subprime crisis was, in the eyes of our dear central bankers, also initially “contained.” As such, this most recent episode serves as a reminder that gold may play an important role as a diversifier in investors’ portfolios. Beyond gold, why do we even bother about the euro, why haven’t we written off the euro? Part of it is precisely because so many others have written off the euro. The euro, in our assessment, is cheap. The question is whether it is going to get a lot cheaper or whether it will appreciate from here. To answer that question, we ask whether trouble in Cyprus, Greece, Spain, Portugal and Italy will be reflected in domestic bond markets or the euro as a currency? As a crisis morphs into new phases, the market learns to differentiate: in 2010, the euro dove toward 1.18. At the time, we argued that the issues in the Eurozone, as serious as they are, ought to be expressed in bond market spreads and that the euro gets sold in large part because of greater liquidity in the currency market compared to domestic bond markets. Sure enough, these days, the Italian bond market, rather than the euro, sells off when Berlusconi’s fortunes rise in the polls. Insufficient reform in Spain is foremost a problem for the Spaniards. What makes Cyprus different is that yet another sacred cow has been slaughtered: to make confiscation of “insured” deposits a real possibility sends shockwaves beyond the tiny island. It highlights the weaknesses in Eurozone decision-making. For that, the euro deserves to weaken in the short-term. But the assurances that this is unique to Cyprus also make sense - at least for now. However, another seed of uncertainty has been planted. Risk friendly capital chasing yields in the Eurozone better be on alert: the word “risk” does, indeed, mean that capital is at risk. As such, while we do see value in the euro, we do not recommend that anyone open an account in a bank in Cyprus. Before we get too bogged down about Cyprus, let’s not forget that the Federal Reserve (Fed) is meeting this week; that the Brits might give the Bank of England (BoE) flexibility to change its inflation target; that the Japanese may soon be writing a new chapter in monetary madness. To be in the loop as we discuss these issues, sign up for our newsletter. Also, in our upcoming Webinar, we discuss how to manage currency risk in an equity portfolio: click here to receive more information about our monthly webinars.